For most people, docks are a way to enjoy the Great Lakes and inland waters. But for townships trying to calm public-private tensions where roads end at the water, docks are a big headache. Developers lay out roads in plats to prevent landowners from having to trespass to get to their property. Many plats result in roads that end at the water’s edge. People who don’t own lakefront property often access the water through these road ends – and erect docks for recreation – causing conflicts with people that do. The struggle has been in the courts for years; public docks add to the confusion. Great Lakes states regulate road-end docks differently. Michigan allows about one public dock per road end, depending in its width; permanent mooring of boats is banned. In some other Great Lakes states, there are no hurdles to putting up road-end public docks – considered legal navigational aids to the water. 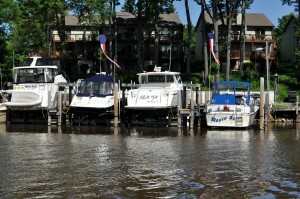 In Minnesota, mooring more than six boats requires a permit. But rules rarely prevent conflicts. Consider northwest Minnesota’s Eagles Nest Township, about 70 miles north of Duluth. Frustrated officials recently asked for legal and state help in a conflict involving waterfront property owners and people who don’t live on the water. 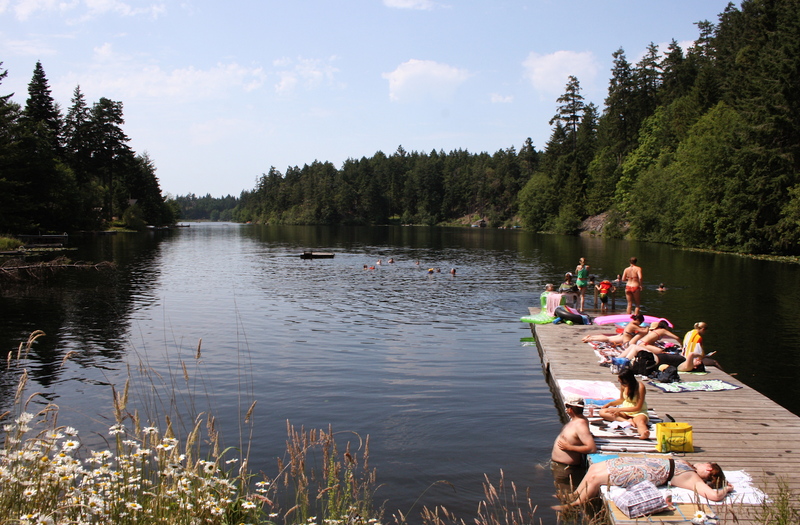 The latter built docks along an inland lake at road ends. Early mining operations encouraged developers to end roads at lakes. But when iron ore took a dive in the 1960s, northwestern Minnesota was left with scores of little towns and platted roads – which are difficult to deal with, said Township Supervisor Sandra Welsh. “The people who originally designed them hoped they would do a lot of good, but they just left us with a lot of headaches,” she said. Waterfront property owners are angry because others can enjoy the lakeshore without having to pay lakeshore property taxes, Welsh said. The township planned to prepare a lease agreement for individuals using the land, which includes a parks and recreation area entrusted to the township. But then an attorney warned it could “walk into a real quagmire of a mess” if it got involved, she said. A township can become responsible for a road-end public access site if it takes any action, and officials may not always want that. “A lot of times, small municipal townships run into a lot maintenance problems and they’re looking to save money,” Dale Simon, chief biologist of Wisconsin’s Department of Natural Resources Waterway Protection Section. Some townships will preserve their public access to Great Lakes waters at any cost. Ganges Township in Michigan is fighting for control over a road-end beach by proving it has facilitated recreation. It’s been a 40-year battle, and the township will continue to appeal until the courts rule in its favor, said Michigan attorney James Nelson. Eagles Nest Township opted to stay out of the conflict. But Welsh worries that tensions will rise between dock builders and waterfront property owners. “We’ve been trying to reconcile this in a way that doesn’t come to blood and guns,” she said. Eagles Nest isn’t the only township faced with such a struggle. That’s usually when local law enforcement gets involved, Hovey said. There’s a lake near the Minneapolis-St. Paul area that has several public access points at the end of two lane roads. There are usually a dozen or more boats on the roads leading to the lake, Hovey said. “We get calls from neighbors complaining. They have people mooring in front of their property and creating dangerous situations for their kids,” he said. Before 2002, Minnesota required a permit for mooring more than six boats at a public or private dock. The state tried to give regulatory power to townships, but local officials did not step up to create their own rules, Hovey said. The state supported the permitting process again in 2009. Bigger boats may also be to blame for crowding. That’s not true everywhere. A downturn of the economy has people registering more canoes and kayaks than power boats in Pennsylvania, said Robert Nestor, northwest regional manager for the Pennsylvania Fish and Boating Commission. Ned Dickman, chairman of the Great Lakes Boat Federation, also sees fewer power boats throughout the region. He blames it on high gas prices. But he gets plenty of calls from people who want more access to the water. People are buying up premium waterfront property, and boaters are worried about losing access to inland lakes, Dickman said. More private ownership of property along Michigan’s inland lakes means more road-end beach conflicts, said William Carey, a Michigan attorney who represents waterfront property owners seeking ownership of public access sites. Carey once handled a case where cars parked along a narrow road-end access site along an inland lake. “Both sides of the road for a considerable distance were clogged up with vehicles and trailers, making – in some documented circumstances – difficult if not impossible for occupants of the homes on their side of the road to get out of their home,” he said. That also made it difficult for emergency vehicles to access the road and beach, Carey said. Public beach access conflicts at roads ends were a problem in the 1970s and will likely persist, said Chris Shafer, a professor at Cooley Law School in Michigan. But there are ways to keep the peace. “If folks respect the private property owners on either side, the owners tend to be satisfied,” said Howard Baumann, supervisor of Port Sheldon Township in Michigan, which maintains two road-end public beaches. Since keeping a watchful eye and erecting signs to prevent late-night beach activities, the township hasn’t seen many conflicts, Baumann said. Editor’s note: This story is part of an occasional series on public access to lakes at road ends. here are your public represenetives who are leading the way to take away YOUR/the Publics beach access opening up the jail doors for BEACH WALKERS and others tresspassing on stolen lands-just because you paid money for it and taxes on it does not necessarily make it ALL YOURS…if who came first/who was here first is the answer…then i guess we will all have to give back the lands that were stolen from the NATIVE AMERICANS-how you like dem apples?-friggin Lawyers will be the death of us all. WAR of the classes-between the haves and the have not’s! those with money running/ruining the show for the rest of us. ask the first nation peoples what they think of the ‘white mans laws’ and see what you get as a response. Idiocy and greed run amok-from lobbyists on up to the white house.funny these lobbyists are funded by the wealthy lake shore property owners- who for some, the issue of who owns the beach is the ever present drive we are now getting wind of. there are some organizations that their only purpose is to reclaim lake frontage and establish private access keeping the commoners to the public parks-(here is one of the biggest offenders- http://www.saveourshoreline.or… ERNIE KRYGIER is the President of S.O.S a wealthy Saginaw bay business owner beachfront property owner who does not enjoy the public on his beach). beach strollers, surfers kayaker’s, birdwatchers, skim boarders, kite surfers, and people watchers. (i think the rich have the biggest problem not feeling anonymous at their beach homes) they dont want to be reminded of how they got where they are and how big a disparity in lifestyles between the wealthy and the poor there really is. the BEACH IS EVERYONE’S if you wanna live there you will have to pay high taxes, high landscaping/coastal armoring costs-high building costs(takes money to keep the lake from eating your home if your TOO CLOSE )and the loss of privacy you wealthy keep trying to buy. WE ARE ALL LIVING ON STOLEN LANDS! the LANDS BELONG TO FIRST NATION RACES! AND TO FURTHER THE RIFT BETWEEN THE RICH AND THE POOR….. KEEP UP THE BAD WORK-your doing great. surrounded by liars and crooks. Yes it is true Tom is well known in the White Lake area and respected for the courage to tell the truth about the political corruption of White Lake. Tanya is well known in the White Lake area for making her kind of claims. Fair enough, follow the money. I certainly didn’t mean to “like” Tom’s comment about White Lake,and there is no way to reverse it. Tom is well known in the White Lake area for making these kind of claims. Ganges Township are amateurs compared to the White Lake area in Muskegon County with its vast historic violence and corruption experience on the topic of road ends. The public trust is what we all need to respect. The water and access to it has been blocked by people who were allowed initially to place a temporary shelter on the beach while they visited the water. This grew into people taking ownership of the access and restricting the public from enjoying the public trust which includes the water and the beach. Some type of accommodation for both private owner and public user must be created. In some cases this may require public domain purchases of property to create of better road end arrangements for the public. Each township should recognize their situation and take action as necessary. We all share the water and the access to it. It’s long overdue for townships to accept ownership of these roadends from county road commissions and create parks for public access to our precious water resources. The townships can regulate use and control the conflicts. Just saying that it is a difficult situation is not a solution. Bill, I think you have it backwards. My understanding is that Ganges Township is trying to keep the road-end beaches open to the public. You’re absolutely right, however, about our corrupt Supreme Court. These radical activist judges are an embarrassment to our state. “Ganges Township in Michigan is fighting for control over a road-end beach by proving it has facilitated recreation. It’s been a 40-year battle, and the township will continue to appeal until the courts rule in its favor, said Michigan attorney James Nelson.” Ganges Township and Jim Nelson both know Michigan has a corrupt tea party controlled Michigan Supreme Court that will be on their side, thus comes the until the courts rule in its favor. Typical rich class money taking more away from the “Public Trust”.